Progressive collapse is a failure mechanism that causes local damage of one structural element to progress throughout the whole structure leading to collapse of the entire structure. Recent catastrophic structural collapses in the world have drawn attention from structural engineers to the importance of designing structures that will continue to be operational even after some local failures occur. 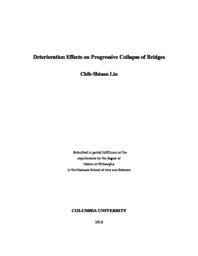 For some bridge types, although the design of each single member follows the proper design standards, they still cannot provide sufficient degree of redundancy to withstand a local failure without the total collapse of the entire structural system. In this study, two truss-type bridges, a half-through pedestrian bridge and a through-truss bridge, are investigated. The design configurations follow the AASHTO specifications, and they are usually classified as fracture-critical, non-redundant structures. Furthermore, traditional design and evaluation procedures generally classify through-truss bridges as single-load-path structures. However, due to the configuration of this bridge type, alternative load paths in the bridge could exist, indicating that this type of structural system has the ability to continue sustaining further loads after one of its members reaches its ultimate capacity by using different load paths. It is important to note that, since the structural load-carrying capacity strongly depends on the location of the damaged area, the progressive collapse mechanism of a structure could change substantially under different damage conditions. For the pin-connected pedestrian bridge model, the analysis showed that the failure of a local member is not responsible for the bridge’s collapse. Instead, it is the global buckling (instability) of top chord system that led the bridge to collapse. A modified 2D structure was studied to properly match the buckling load and its associated deformed shape with those obtained in the 3D model’s top chord system. The conclusions of this study verified that the collapse mechanism of this type of bridge is linked to the instability of the top chord system. For the same pedestrian bridge with beam-type connection, the bridge’s failure mechanism is instead associated with the local buckling of an upper chord element that led the bridge to collapse. Therefore, the pedestrian bridge should not be considered a fracture-critical structure since the failure mechanisms that led to its collapse were associated with large compression forces in the upper chord. Looking at deterioration effects on bridge performance, corrosion is one of the dominant causes of deterioration in steel bridges due to aggressive environment and inadequate maintenance. The effects of corrosion damage could alter significantly the bridge behavior depending on the extent of deterioration on the bridge structure. Comprehensive nonlinear analyses were conducted to investigate the changes in collapse mechanisms considering various corrosion level and different corroded locations. Results from the deteriorated pedestrian bridge analyses showed that the deterioration of corroded top chord members could significantly reduce the load-carrying capacity of the bridge and lead the structure to sudden catastrophic failure even for a load lower than the one used in the original design. For the through-truss bridge model, the cases with a corroded middle diagonal member revealed similar load-carrying capacities and collapse mechanisms to the undamaged bridge. These models show similar collapse mechanisms, related to the bending failure of the middle bottom chord and the local buckling of the middle top chord. When the corrosion of the top chord element is severe, the collapse mechanism of the bridge is still linked to the buckling failure of upper chord together with the bending failure of the middle bottom chord. However, the load-carrying capacity of this damaged bridge could drop considerably when compared to that of the undamaged model. Among all the cases analyzed in this study, the corrosion of the end post element represents the most critical case: here, the results indicated a considerable decrease in the load-carrying capacity of this damaged bridge model when compared to that of the undamaged bridge. In addition, this study also focused on the effects of support settlements on the load-carrying capacity and on the collapse mechanism of deteriorated bridges. It was found that, even with only a slight differential settlement support, the bridge model with a localized corroded diagonal element reached its ultimate capacity much earlier in the loading process than the bridge with fixed boundaries, with a reduction of the original load-carrying capacity of about 15%.